I get angry so easily! 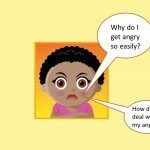 Do you find that you get angry so easily and feel your anger gets out of control? You are not alone. However, you must remember that anger can be both a positive and negative emotion. We all have angry feelings now and again. Anger is a normal emotion and in itself it is not a problem. It becomes a problem if you express it verbally or physically. Do you know what you do with your anger and how you express it? Does it feel out of control? Anger is only a problem when it occurs too frequently, when it is too intense, lasts too long or if it leads to aggression. Anger becomes very problematic when it disrupts our relationships with those close to us, as well as those we don’t know. If you find that you are a person who gets angry quickly or are concerned with how little control you have over your anger, the following steps are a guide to assist you to dealing with your anger. Recognise the external triggers that are likely to increase your anger. For example do you find that you can quickly become angry when you are hungry, tired, stuck in traffic, stuck in a crowd or if you are being ignored. Once you have identified what your triggers your anger you need pinpoint what is it about these situations that you find so upsetting. Once you have identified your triggers, you can then ask yourself are there any thoughts or self-statements that you could say to yourself when you are faced in any of these situations? These new thoughts need to take control of the conscious or unconscious thoughts that presently exist in you and are triggering your anger. If may be helpful to see if you can identify what your present angry thoughts are. Once you have done this you can work out a list of helpful statements that you can say to yourself when you start to feel angry. I know this situation is going to be upsetting but I know I can deal with it without getting angry. I can feel myself getting angry so I must stop. I must not take what that person said personally. I’m not going to let this person get to me. This is a challenge – I must focus on staying calm. Try to recognise the physical signs of tension that is in your body when you get angry. For example, do you clench your fists or tighten your biceps. Do you notice if you breathing is shallow or you get an accelerated heart rate. If you find you do have physical symptoms then you need to learn to relax. Try practising muscle relaxation exercises with slow controlled breathing that you can use if you are sensing that you are getting angry. As well as the helpful statements above you could try to imagine a peaceful scene, such as calm or imagine a peaceful scene. Alternatively you could try something that distracts you such as counting backwards. Examine your life style. Are you experiencing stress or something you cannot cope with as anger is usually a symptom of being overstressed and feeling unable to cope? If you are stressed ask yourself if can you change the stressful situation or if can you get help with the stress? Increasing your exercise levels can often help with reducing stress. Finally you need to have an opportunity to ventilate and explore your feelings around your anger. This could be with a close friend or with a counsellor. When you are next in an angry situation and able to use the above techniques to help you deal with your anger you must not forget to congratulate yourself in staying calm! This entry was posted in Anger, Anxiety, counselling, Personal development and tagged anger, angry, counselling on December 8, 2014 by Hazel Hill.